On Friday, July 8th, Oakland Unite’s Messengers4Change will begin hosting the Friday Summer Nights Programs in East and West Oakland. These events are free, open to the public and offer free food, games, entertainment and raffles for all ages. 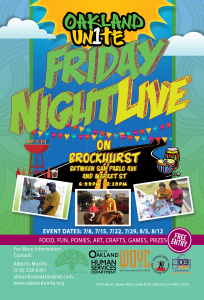 The Friday Summer Nights Programs aim to change community norms around violence through community engagement and empowerment. These programs will run for six weeks, every Friday night, from 6:00 p.m. to 8:30 p.m. 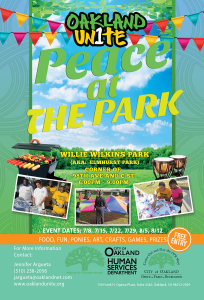 The East Oakland Peace at the Park Program takes place at Willie Wilkins Park, located at 1100 98th Avenue, and the West Oakland Friday Night Live Program takes place on Brockhurst Street, between Market Street and San Pablo Ave. These events are funded by Oakland Unite.